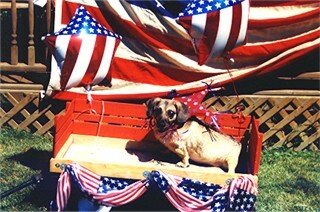 Munchkin went to the Rainbow Bridge on December 8, 2004. Please read the tribute to her written by Katie Matola and Tony Matola. Munchkin's wheelchair was donated to another dog in need. How unselfish of the Matolas and Munchkin to think of another dog while dealing with their loss. Please click here to see pictures of the grateful dog who is now using Munchie's wheelchair. 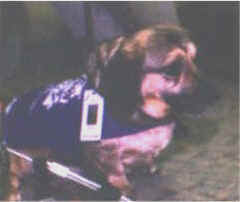 Munchkin - also known as Munchie - was a charter member of the group who was also the inspiration for K-9's for Compassion. Hit by a car and left for dead with a spinal cord injury, Munchkin broke the hearts of caregivers at Animal Charity in Youngstown, Ohio, who could not euthanize this little Dachshund/Beagle mix. Instead, they bought her a "wheelchair" - a cart with wheels that gives her mobility - and cared for her for three years before she was adopted by Tony Matola's family in Hubbard. The Animal Charity staff took Munchkin to visit nursing homes and asked that Tony continue the practice. His daughter, Katie, arranged for the visits and soon became hooked on the immensely satisfying experience. Katie loved the idea of visiting with animals in facilities, but as a Licensed Veterinary Technician, she could also recognize the dangers in just allowing anyone with a pet to walk into a facility. It was at this time that Katie started to look into the National Registries, and she chose Delta Society because of the thoroughness of the program, and their strict standards. Katie's goal was to also visit in the hospitals, and she knew that the best chance to visit at the hospital was to hold the highest standards possible. Shortly after, K-9's for Compassion was born. At 10-years-old, Munchkin still didn't know she was "handicapped." She gets around just as good as any other dog. When she visited at St. Elizabeth's, she enjoys being petted behind the ears and lying on the bed with patients. Her eyes seemed to express the complete enjoyment she experienced from the entire visiting process. 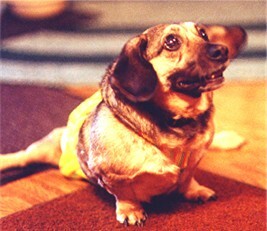 Munchkin was Pet of the Day in June, 1998. Follow this link to read Munchkin's full story. Last updated: January 27, 2006.